Stylish wedding albums printed on quality fine art paper and a beautiful matte finish. Lay-flat pages for seamless full-page spreads. 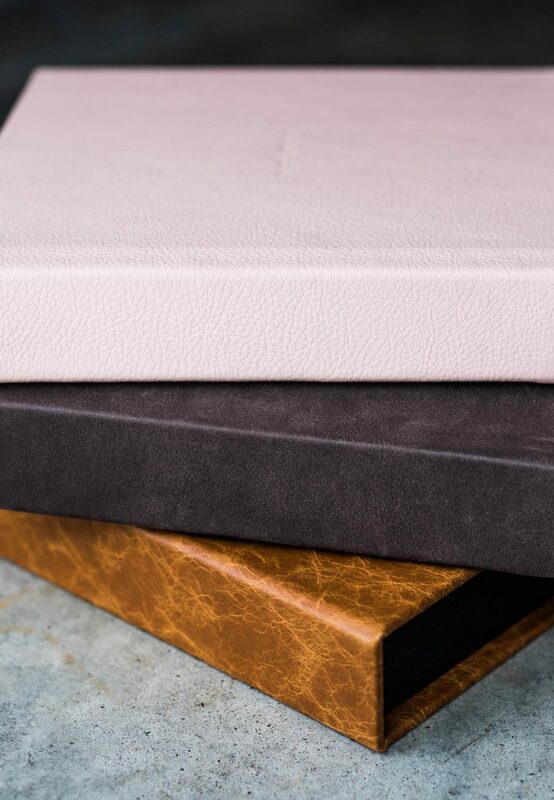 Luxurious cover materials including leathers and beautiful fabrics. Colour choices include natural linens, bold colours for the more adventurous couples, and stylish leathers. We also offer slick full photo-wrap covers. We also get creative with custom designs to personalise the cover by embossing your names, wedding date, and illustration embellishments. Forget the old-fashioned wedding albums from your parents and grandparents generation. You won’t be hiding your wedding album in the cupboard to only bring it out on special occasions. Our wedding albums are modern and stylish, think of them as a beautiful art book that you will proudly display on your coffee table. With all the modern cover colours, your album will beautifully fit in with your home furnishings. Wedding Albums are available in Horizontal (landscape) or Square. Horizontal albums are available in 14×11, 12×9 or 10×8. Square albums are available in 12×12, 10×10 or 8×8. Choose leather or fabric covers in many colours. Leather & fabric covers can also be embossed for personalisation. Choose from leather, fabrics and photo-wrap covers. bold colours, pastels and classics. Custom designed artwork stamped onto the cover of your album. We have a library full of fonts to add the bride and groom names and wedding date for a personal touch. Choose either a Clamshell style box or Slipcase. Both are custom made to fit your album. Contemporary designs that let your special wedding day moments take pride of place on the page. The beautiful archival-quality of the fine art paper will have your photos looking stunning for many years.